After the Piano & Rice partnership was dissolved in 1981, Rice was approached by architect Adrien Fainsilber (b.1933) to work on the structural engineering for the Cité des Sciences et de l'Industrie — Paris' new science museum, planned for Parc de la Villette in the 19th arrondissement. The Swiss-born Frenchman had won a limited competition (1980) to undertake the museum's design. La Villette, one of the largest parks in Paris, is the site of a former meat wholesaling complex dating from the 19th century. The museum would re-use some of the vast but incomplete market and abattoir structure begun in the 1960s. 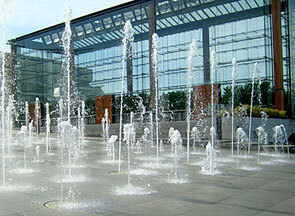 Fainsilber's scheme has a close relationship with the park and includes moats and glass façades. The design of the park itself was part of the competition but in the end it was the plans of architect Bernard Tschumi (b.1944) that were built. Tschumi consulted the French deconstructivist philosopher Jacques Derrida (1930-2004). Rice turned down the structural steelwork design for Fainsilber's project but was very interested in the architect's idea of integrating three huge glass greenhouses in the façade facing the park. These were soon to be known as simply Les Serres. Several glass roof domes were also proposed. Here was an opportunity to explore in-depth the possibilities of another material. However, Ove Arup & Partners hadn't wanted to continue in France after the completion of the Centre Georges Pompidou. As Rice's arrangement with the practice allowed him to set up other relationships in parallel, he decided to form a new team to work with Fainsilber. To work in France effectively, he knew he would need a French base and French-speaking staff. First, he invited to join him industrial designer Martin Francis, who had worked on the groundbreaking Willis Faber Dumas glass façade (1975, engineer Anthony Hunt) while at Foster Associates. Rice and Francis then approached architect Ian Ritchie (b.1947), whom Francis had met on the Willis project and Rice knew from Arups' lightweight structures group and various projects. Together they formed Rice Francis Ritchie, or RFR (1982), a specialised engineering practice with architect involvement and design aspirations. RFR set up in Paris, and the team was soon increased to include engineer Henry Bardsley (b.1950) — who had worked on the Beaubourg project, at Arup France and at Piano & Rice in Genoa — and young British architect Hugh Dutton, future co-author with Rice of the book Structural Glass. By 1982, the structural concept and first ideas for a glass suspension system for Les Serres were on the table. Up to now, the glass façades of most buildings involved frames and mullions of some type, doing the structural work and holding individual panes in place. The frameless glass curtain walling of the three-storey Willis Faber Dumas building broke new ground, using bolt-connected full-height vertical glass fins perpendicular to the main glass plane for lateral stiffness. Transparency was the aim for the greenhouses, as their primary role is to create a transparent transition zone between the building and the park (and harvest solar energy). Rice and the team looked at the basic characteristics of glass to undertstand how it could be used structurally and so require little in the way of visual impediments. Although glass is strong, it breaks easily under certain conditions. To use glass structurally, the loading needs to be perfectly vertical in its plane. The solution they came up with is an articulated bolt suspension system with a cable support arrangement collecting the horizontal loads — all of which was developed in close co-operation with industry. The techniques and connectors they developed for Les Serres form the basis of all subsequent cable-supported glazing systems, which can now be seen on buildings all over the world. Essentially, the team was trying to construct huge panes of glass from smaller pieces — the largest tempered glass available at the time was 2m square. As little as possible should hinder the transparency, although signalling the location of the glass plane was a subtle element of the solution. The design principle is that the structure controls the forms of the elements. Form following function. Rice and Dutton's book describes the four elements that make up the system — the glass itself (in panels but considered as a whole), the suspension system (springs at the top of panels and H-shaped assemblies at the corners where panes meet), horizontal prestressed cable trusses (wind bracing), and the stainless steel structure supporting the whole system (located just behind the glass). The main structures are attached to two large concrete cylinders clad in stainless steel, one either side of each greenhouse. Nothing at all protrudes from the exterior of the glass, not even fixings. Fainsilber again: "The preciousness of the assembly systems blends with the sobriety of the composition to give an impression of monumental lightness and purity." As the system developed for Les Serres was new, there was little in the way of relevant established codes of practice. Extensive peer review was required by the checking authorities — Bardsley recalled the poor French used in their paperwork. Arups' senior partner Jack Zunz gave the team computing time in London and they used software developed by Alistair Day to show that their approach would work. RFR later patented the system under the name 'La Rotule'. Rice and RFR used the articulated bolt suspension system for a number of other structural glass projects in Europe, including the Passerelle Lintas in Paris (footbridge, architect: Marc Held, 1985), two huge greenhouses at Parc Citroën Cévennes also in Paris (architect: Patrick Berger, 1987-92), glass walls at the TGV/RER Station, Charles de Gaulle Airport (architects: Paul Andreu and Jean-Marie Duthilleul, completed 1994), a glass canopy at Verdun in France (architect: RFR-Peter Rice with Roustang, Cuzon & Grandgeorge, 1990) and the Pyramide Inversée, Grand Louvre (architect: IM Pei, completed 1993). RFR is also associated with the Pyramide Inversée's better-known 'forebear', the 21.6m high steel and glass pyramid that marks the modern entrance to the Louvre. Architect IM Pei and his team had been working on a major replanning scheme for the museum since 1983, placing extensive new facilties under the central Cour Napoléon. RFR was engaged as engineer during the construction phase, which began at the start of 1985. Pei asked Rice for advice on the pyramid's structure, though there was little he could do to refine it so late in the day. At the same time that Rice was working on Les Serres, a Renzo Piano Building Workshop project came along that enabled an exploration of transparency using polycarbonate and timber instead of glass and steel. In his book, An Engineer Imagines, he says that both projects helped him clarify how "... the physical characteristics of a material can be used to influence the way in which the detailing and the form of the solution are developed". The IBM Travelling Pavilion (1982-4) was an Arups project, described very succinctly by the architect as "... a pristine barrel vault of transparent polycarbonate pyramids with shapely wooden struts and metal joints, the whole poised above the grass on its raised structural floor" (Renzo Piano Building Workshop, Vol I). The pavilion toured Europe 1984-6 (London site), displaying IBM's computers. Polycarbonate is light and robust but not structurally strong nor very stiff. For it to perform a structural role, the joints had to overcome these limitations. Cast aluminium is used for the articulated strut connections. The barrel vault is composed of a series of 12m span timber 'ladder' arches set side by side and pinned at the floor. A third outer timber chord connects the polycarbonate pyramidal infill panels at their apexes. Rice pointed out in his book that the intelligent approach of the French bureaux de contrôle (checking authorities) at this time made both Les Serres and the IBM project possible, something that also helped the design team during the Centre Georges Pompidou project. RFR started out as a small inventive group, able to pursue innovative technical ideas and specifically established to work in the French design environment. They had soon found that there were clients who wanted this kind of approach, as indicated by the list of high profile projects they tackled. After the completion of the work at La Villette — RFR had undertaken further aspects, including the structural design of Tschumi's steel Galeries (1986) in the park — Ritchie withdrew from the partnership in order to concentrate on his own architectural practice. Francis became a sleeping partner, though he would resume work with RFR after Rice became ill in 1991. RFR remains relatively small but has global impact, with offices in France, Germany, China and the Emirates. 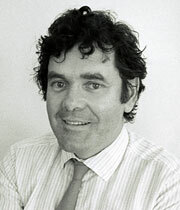 In 1989, Rice's son Kieran moved to Paris, after completing an engineering degree at the Univeristy of Nottingham. Today he leads the firm his father founded. 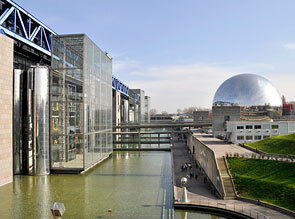 A recent photo of La Cité des Sciences et de l'Industrie, Paris' science museum, in Parc de la Villette. The huge greenhouses (now out of use), known as Les Serres, form a transition between the building and the park. Structural glass walls are now a common feature of buildings all over the world — this is where it all started. Detail of the cable support system that collects the horizontal loads, such as wind loadings, for the huge composite panes of glass in Les Serres. 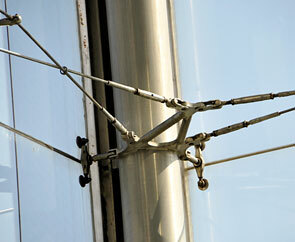 The frameless glass is clamped together using an articluated bolt system. H-shaped assemblies on the interior side of the glass are used where four sheets meet (corner detail assemblies are visible in the photograph). Groups of panes, forming panels, are suspended from the main steel structure. Rice and RFR used the articulated bolt suspension system developed forLes Serres in a number of other projects. One example are the huge glasshouses (1987-92) at Parc Citroën Cévennes, also in Paris.